There is no sugar coating it, Bestway is not the most familiar name in the industry of inflatable paddle boards and that makes it hard for us to make any purchase. Generally, an unfamiliar brand is almost always synonymous with low quality but to think of it, even the most prominent names in the industry of iSUPs right now were once perfectly buried. It would be a little pretentious to judge a book by its cover without at least giving it a shot as it would be unfair to dismiss Bestway without giving the Hydroforce WaveEdge a shot to present itself. Hence, let’s take a closer look into this board together and figure out what it has to offer. Being an unfamiliar board, Hydro-Force WaveEdge has to depend on its qualities completely to compel us and that starts with its size. Indeed, the size of a board can make or break the deal from the get go because it determines its compatibility and influences its performance. Starting at the most impactful dimension, the Hydro-Force Wave-Edge measures 12 feet 2 inches in length which tremendous. The board’s length makes it compatible mostly with adult paddlers At 12 feet, the board is made quite large enough to grant the paddler a larger platform to use when paddling while maintaining the ability to control it. Moreover, the iSUP board at hand measures a humble 27 inches in width which is considered a a bit narrow. The Hydro-Force Wave-Edge is a couple inches smaller than the average iSUP, however, it is still considered to be relatively pretty wide and that will be evident once you get onboard. Indeed, the board will grant you relatively enough room to balance yourself out while remaining generally stable in most water conditions. Down to the least discussed dimension, thickness is often disregarded because most of us don’t really know just how impactful it really is. In fact, the thickness of a board not only influences its performance but even its quality. Hence, the Hydro-Force Wave-Edge stands at rather shy 4 inches which could have been better. Fortunately, the 4 inches thick board is still capable of taking a beating as long as you respect that weight limit. PS: The maximum weight capacity that this inflatable paddle board is capable of handling is around 220 pounds. You can stress quality enough when it comes to inflatable things in general because it’s just so freaking important. Accordingly, inflatable paddle boards suffered from the lack of trust in this area that until a new type of build quality was introduced. 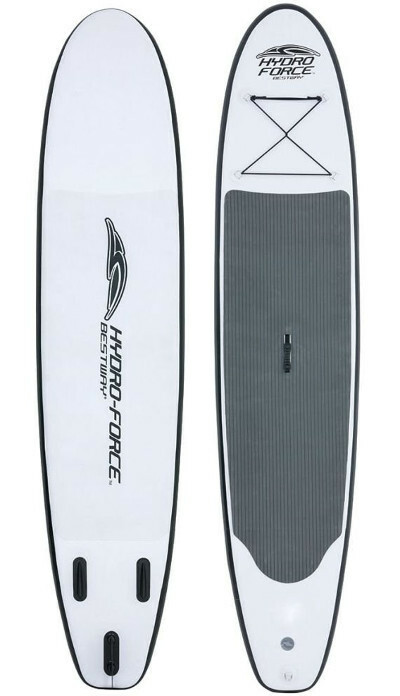 The Hydro-Force Wave-Edge is a solid representative of the tough inflatable paddle board union because it is made of solid military grade PVC material. In fact, this is the same stuff that zodiacs, river rafts and even certain bulletproof vests are made of. Despite the fact of being double layered, the board is even further reinforced via an industrial drop stitch construction, making it pretty much indestructible. The board might not be capable of taking a ton of weight but it is definitely made to outlast the harshest environments with minimal damage. The board at hand might be extremely inexpensive but it still features a splendid gripping pad that covers pretty much 50 percent of the board’s platform. The pad is actually the best part about this board because it not only improves your stability and resilience but it’ll also grant you a better command over the board which is much needed especially for beginners. Like most inflatable paddle boards out there, the board at hand comes with four D-rings on the nose attached with a bungee cord making a great cargo net. Some Hydro-Force models actually don’t come with a cargo net which can be taken in two very different ways. The claim behind this rinsing is the manufacturer’s will to preserve that authentic feeling of a hard board that is free of any blemishes and distractions while on the other hand, the net is pretty darn practical. In the end, it really depends on what kind of a paddler you are and what you really cherish the most, authenticity or practicality. We can’t really skim through the features of this board without at least acknowledging the central carry handle. Indeed, the carry handle on this board is pretty much indispensable since it is the only way to individually carry it on land and it’s a feature which will be much appreciated. As you anticipated, the Hydroforce is not a racing board. However, it is still one hell of a budget-friendly recreational inflatable paddle board. Indeed, the board at hand is designed with a beginner in mind but that doesn’t reduce the fact that it is still one hell of a performer. In that respect, Hydroforce is enhanced due to its smooth edges, lifting nose, low resistance hull and tri-fin setup. What must be kept in mind however is that this is by no means a competitive board because it is optimized for beginners which means that it advances stability, responsiveness and sturdiness over acceleration and sharpness. 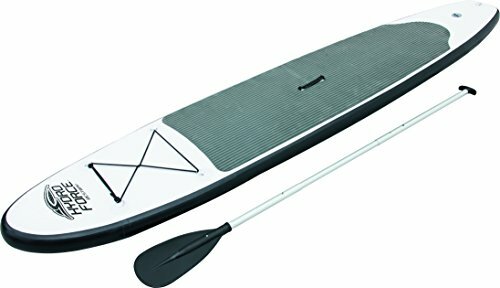 Bestway HydroForce WaveEdge iSUP is a great cheap inflatable paddle board. It’s easy to use, inflate/deflate, transport and very affordable.